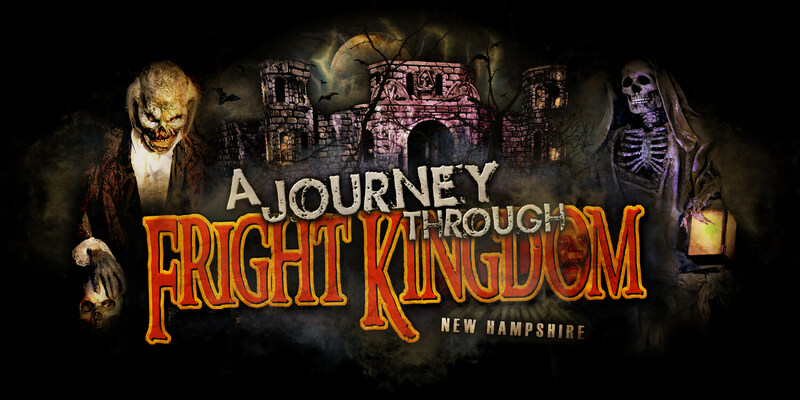 Located in Nashua, New Hampshire, Fright Kingdom is the largest indoor haunted attraction in New England. This 65,000 square foot attraction boasts three indoor haunted houses including the Victorian themed Bloodmare Manor, insanely twisted Psycho-Circus in 3D and newly erected Vampire Castle. To say that this operation is imposing is an understatement. The 20,000 square foot workshop alone is bigger than many commercial haunted houses. Add to that, offices, a spacious makeup/costume area, actor recreation room (complete with kitchen, lockers and showers) and you can quickly become envious of its massive layout. Beyond its impressive stature, Fright Kingdom features detailed set design, energetic live actors and sophisticated animations spread throughout its monstrous footprint. As you walk through the attraction from one room to the next, you can tell a great deal of thought, time, and creativity have been expended to produce this venue. Tim Dunne and the crew at Fright Kingdom work year round to expand upon, change and refine the shows each season. Last year they were faced with the daunting task of moving the entire operation into their spacious new digs. Completing that move would be enough for most crews, but once finished, they immediately started reworking existing rooms and building a brand new walk-through attraction for 2009. All The builds are done in house and most of the construction is environmentally "green". Tim's demolition business allows him to recycle materials removed from demolition jobs for use in the attraction instead of creating waste and paying to dispose of it. The savings is two-fold and includes raw materials like wood and metal as well as building fixtures. Fright Kingdom is really a unique place to visit. Owners Tim and Angela Dunne have a level of love and respect for the industry that is rarely encountered. This respect is evident in their large collection of vintage props obtained from other legendary haunted houses. The Dunne’s proudly display these artifacts and seamlessly incorporate them into their show. During a tour of their haunt, you'll encounter bits and pieces salvaged from defunct places like Terror on the Wharf, Dracula's Castle and the old Spooky World among many others. It seems there is always a back-story to these items and Tim is quick to point them out which creates a museum-like depth to the attraction. 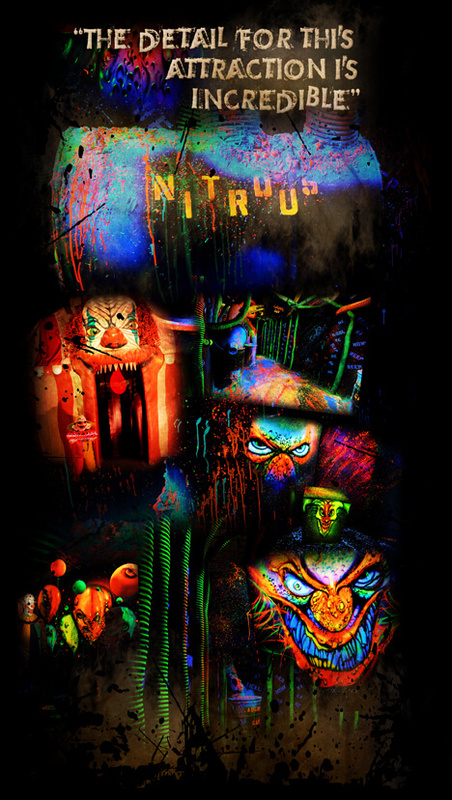 The "Tarantula Tunnel", live reptile display, fortune teller and sideshow curiosities are also unique exhibits that give Fright Kingdom an indoor carnival like atmosphere. From the time you set foot in the door and get your tickets (along with an accompanying loud blast of air at your feet), you know you're in for a good time. A tour of Fright Kingdom begins with a stroll through the Tarantula tunnel which contains over 400 live giant tarantulas from around the world. It continues by winding your way through the "Village of the Undead" queue line area while immersed in a variety of old world and Victorian style buildings. Some of these distressed buildings feature audio animatronics characters that entertain guests while waiting in line. Arriving at the front door of Bloodmare Manor, you are greeted by one of the house's slightly disturbed residents who recites the house rules and promptly ushers you into the front room. As soon as you enter the manor, the influence of Disney's Haunted Mansion is apparent. The Disney like quality and attention to detail is obvious. The large, dimly lit Victorian study is richly garnished with antique furniture and accessories. You can't help but get distracted trying to take it all in, when a cadaver in a chair suddenly moves. Welcoming you to Bloodmare Manor, the corpse of Ezra Bloodmare begins reciting the manor's dark past. As the grim story unfolds, the room starts taking on an increasingly sinister appearance. 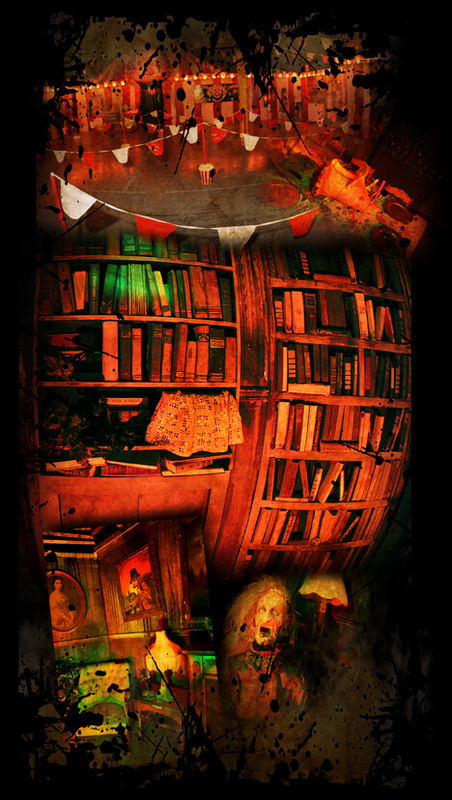 Creepy faces appear behind the paintings, books start abruptly moving and skulls on a chandelier come to life. The entire sequence in this room is computer controlled and allows the greeter to alter its length according to guest wait time. Once the story has reached its conclusion, a sliding bookcase moves to reveal a passage into the manor's bowels. The remainder of your journey takes you through long dimly lit hallways and creepy rooms typically found in an old haunted mansion. Emerging from the manor, you're immediately thrust into The Psycho Circus queue line area. The detail for this attraction is incredible and features sideshow items for patrons to gawk at while waiting to go "big top" crazy in the haunt. On display, you'll find things like a chukacabra, two headed turtle, figi mermaid and jersey devil along with many more artifacts gathered from around the globe. As you approach the circus entrance, you're greeted by another of Fright Kingdom's iconic actors who interacts with the group and determines which of them is most afraid of clowns. The greeter generously offers the "clown hater" a special protection balloon to bring with them through the haunt and suggests that they write their name on the balloon for safe keeping. Now, every clown working the haunt not only knows who to target, but their name as well. The "clown hater" is tormented throughout most of the maze until a clown finally jumps out and pops the balloon. The show definitely goes on at Psycho-Circus 3D with excellent detail, top-notch acting and fun sets. The twisted 3D art provided by Stuartism Designs compliments the sadistic clowns and their gags very nicely. Just when you thought you had your fill of fright, the tour continues through the newly added cemetery queue area into the Vampire Castle. While it the smallest of the three houses it still packs a big punch. Excellent acting and detailed Gothic sets highlight this walk-through and keep the blood pumping. Finally before heading out the door, you are led into the vendor area where there is a fortune teller, dancing zombies and guest celebrities. You can get your photo taken with Medusa, the 17 ft albino Burmese python at the live reptile display and browse Tim's collection of horror movie masks and screen used props. "Overall, the detail was excellent throughout the haunt and it was a great use of space without an over abundance of actors in any one area or overuse of any particular type of scare. As the adventure leads you from one house to the next, you can tell that this is a well thought out attraction with a great deal of resources dedicated to it. We were thoroughly entertained from start to finish. The actor "greeters" for all the attractions are outstanding characters with most of the other actors being way above average with a high intensity/energy level." Actor makeup was top notch, very creative and professionally done." Haunted Houses in Nashua, New Hampshire are some of the scariest haunted houses in America. Hauntworld.com tries to review only the best haunted houses in Nashua, New Hampshire. When you are looking for simply the best, scariest, haunted houses in New Hampshire there is no other place to search than Hauntworld.com which offers our guests the best information to find New Hampshire Haunted Houses including the best haunted attractions in Nashua, New Hampshire. There are many haunted houses in Nashua that claim to the best haunted attraction but only one can truly lay claim to the being the scariest haunted house in New Hampshire... Fright Kingdom Haunted House in Nashua, New Hampshire.